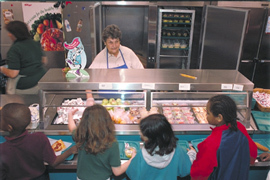 Students line up for school lunch in Florida. The National School Lunch program was created in 1946. Today, over twenty-six million school lunches are served every day in America’s public schools. The United States Department of Agriculture regulates and partially funds these well-balanced lunches. In order to receive federal assistance, schools must serve healthy meals that meet dietary guidelines. For example, each lunch should provide a third of the Recommended Daily Allowances of calories, vitamin C, protein, and calcium. Although the lunches must meet federal nutrition requirements, schools choose what they will serve. Pizza, hamburgers, and tacos are just a few of the favorites that can be seen on lunch plates across the country. Children usually pay $1 for a lunch. However, students from low-income families may pay less or even receive their lunch for free. In some communities, over half of the students are eligible for a free or reduced price lunch. In addition, some schools offer a breakfast program for students. These breakfasts are also regulated by the government and qualifying students can receive them for free or at a reduced price. For some children, school meals are sometimes the only meals they eat each day because their families are poor.